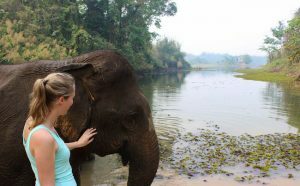 Southeast Asia: exciting cultures, great food, exotic animals. Southeast Asian countries have lots to offer and especially things which often can’t be experienced at home. One of those things is encountering wildlife and mainly the Asian Elephant. Many tourists wish to encounter these amazing animals very closely and a trip to Southeast Asia just seems perfect to make this dream come true. Unfortunately, most of the attractions that offer such experiences are linked to animal cruelty. Tourist attractions that promote elephant riding, elephant shows etc. involve in most of the cases bad living and working conditions for the elephants. This is why you should inform yourself very well before you visit and support an elephant camp – no matter how cheap or tempting they might be. 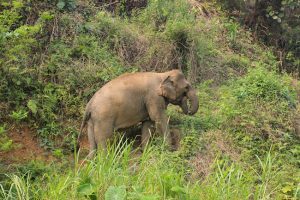 But there are good news as well: there are a few institutions that have specialized on conservation and rescue programs of elephants that used to work in the tourist and logging industry. Those centers offer tourists the opportunity to encounter elephants but without harming them. However, you should always be cautious: there are quite a few companies that call themselves “Conservation Center” although they aren’t. If you read “Elephant Riding” or “Elephant Bathing” you can be sure that this ISN’T a real Conservation Center. 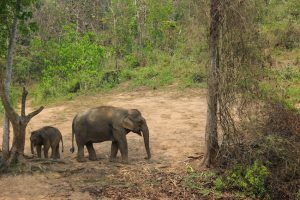 One of the real and really amazing Conservation Center is the “Elephant Conservation Center” in Xayaboury, Laos. I spent there two days and it’s been one of the most unforgettable and fantastic experiences I’ve had while traveling Southeast Asia. 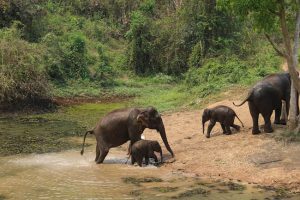 The Elephant Conservation Center in Xayaboury is located about three hours by car from Luang Prabang. The center is build on an island which is surrounded by a lake. 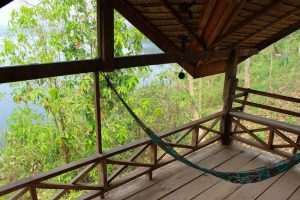 It’s possible to get there on your own or with the company from Luang Prabang (they pick you up at your hostel / hotel in Luang Prabang). There are different options to choose from: you can stay from two to six days there and there are different programs as well. All information can be found HERE. 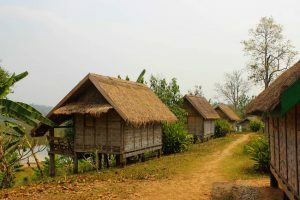 The number of huts (and tourists) is quite low which makes it a very individual experience. Besides the bungalows, there is a small museum on the island which has a really interesting exhibition about the Center’s work and the Asian elephants. 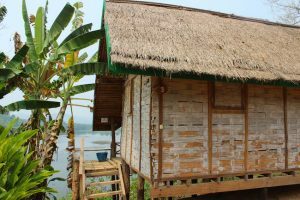 There are also some huts where the staff lives, a big bungalow where all meals are served (the food is delicious! ), a veterinary practice and big bathing areas for the elephants. Now you might wonder: where are the elephants?! 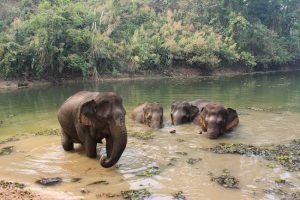 Two times a day they go to the bathing areas with their Mahouts where they can drink, play and bath – without chains or humans on their back. The elephants also have the chance to spend time at the “Socialisation Area” where they can play with other elephants. Tourists can watch the animals from tree houses or directly from the beach. 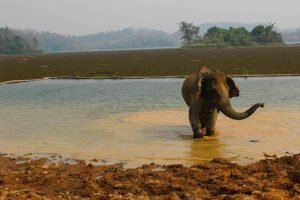 It’s possible to get really close to the elephants (if you like to): I was standing at the shore watching the elephants bathing and suddenly one of the elephants walked out of the water and directly to me. He just stopped in front of me and I had the chance to pet him. What an amazing experience! Another highlight was watching the baby elephants. They live separately with their mothers but they come to a bathing area as well a few times a day. You can watch them from the opposite shore and it was just amazing to see them play and interact with each other. They are just too cute! The two days at the Elephant Conservation Center were absolutely amazing and I’m so happy I had the chance to spend some time there. Even if the price is a little bit higher compared to other tour attractions, it’s absolutely worth it. You can encounter elephants but you don’t have to feel guilty as the animals have great and healthy living conditions there. The staff is really friendly and you can feel that they are very passionate about their work and the aim to protect as many elephants as possible. So if you’re in Southeast Asia make sure to inform yourself about the attractions (internet, tour guide etc.) and especially make sure that no animal has to suffer from your joy.